After last week’s shock loss of 4.5lb I wasn’t really holding out much hope of another great loss this week as I knew there would be a few things possibly stopping me. On Thursday it was my cousin’s eldest’s boys birthday so we had a pub tea (steak & chips, and loads of onion rings) and then birthday cake (though I shared mine with N). Friday was okay, then Saturday we were at my Mum’s and we had pulled pork – I was a greedy pig and scoffed three white rolls with it so just that would have taken me over my syns anyway! Sunday, I had a huge bowl of porridge and then I had some chocolate; then we were at my brother-in-law’s for a curry and I had a whole naan bread and quite a bit of mango chutney, and then more cake! After that I was back to damage limitation, though after everything I had eaten I was expecting quite a big gain. 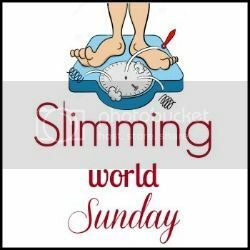 So I was surprised when I stepped on the scales and had only gained 0.5lb – I couldn’t quite believe it! Damage limitation must have worked (if only slightly). I didn’t stay to group though as I had a major headache which was making me debate not going at all, but I got my positive head on and went to face the scales! I’m not sure about next week – I have my monthly bake club meeting though I’ve still managed to lose after the others, but I’m finding it a little hard to get my head fully back in the game at the minute. 2.5lb off would be nice to get my Club 10 though! Did you have an Easter gain or manage to lose? I think thats great, I maintained over Easter which I was shocked about as I was convinced I'd put on a good few lbs!! Sounds like you did a good job balancing things out! I feel like all I do is balance out my weekends atm. Yep it's hard when weekends used to be for munchies! Sounds like you did really well over Easter and only putting on half a pound is brilliant! Keep up the good work and I look forward to following your progress!